Acadia National Park, located on Mount Desert Island in northern coastal Maine, boasts a beautiful combination of natural features. It has mountains, lakes, forests, rocky and sandy ocean coastline all intermingling in its 47,000+ acres. There are many ways to enjoy the scenery of the park, the most straightforward of which is to get yourself a great map, and start walking the many carriage roads and hiking trails. There are more than 50 miles of gravel carriage roads and stone bridges that are great for walking or biking. Hiking trails can be accessed from many of the carriage roads if you are looking for some variety in your terrain. The ‘Around The Mountain’ carriage road is a worthwhile 12-ish mile loop that takes you through the forest, past Jordan Pond, and up around a variety of the smaller mountains including Penobscot, Sargent, and Parkman. As for hiking trails, the mountains are small, most being less than 1,500 feet but many trails are steep and offer a worthy, if short, hike. It is easily possible to climb multiple peaks in one day. Cadillac Mountain, at 1,532 feet, is the tallest point on the Northern Atlantic seaboard. The summit can be reached by car off the Park Loop Drive or accessed by a number of different trails. We opted for the Cadillac West Face Trail, which is the shortest, but steepest (and full of rock scrambling) route to the top. After about a mile the trail connects with the Cadillac South Ridge Trail for an easy half-mile finish to the summit. For the adventurous types, the Beehive and Precipice Trails offer heart-pounding non-technical rock climbs up nearly vertical cliffs. The Beehive is a great warm-up at only about a half-mile to the top and will give you a good idea as to whether or not you are up for the more challenging Precipice trail, which finishes at the summit of Champlain Mountain (1,058 ft). If climbing iron rungs isn’t your thing, you can also take a number of other trails to reach the top, including the short and sweet Champlain North Ridge Trail, which is an easy mile (one way) hike. If you want something very mellow, but incredibly scenic, the Jordan Pond loop is an excellent 3 mile loop around, you guessed it, Jordan Pond. Afterwards, stop at the Jordan Pond House for some delicious hot (or cold, depending on the season) chai tea and fresh popovers. Another flat and mellow, if probably crowded during high season, walk is the Ocean Path. You can park just off the park loop drive in the Otter Point parking lot, and then walk north along the coast. It’s 1.4 miles to Thunder Hole, then another .7 miles to Sandy Beach. There are ample places to stop for a photo op, or just to wander out onto the cliffs and enjoy the scenery. You can easily catch one of the free park loop buses along the way to get back to your car. Outside of the park itself, there are a plethora of activities to suit all tastes. Bar Harbor is the biggest of the towns in the area. There are many shops and restaurants, all easily within walking distance of just about anywhere in town. One notable free activity is the walk to Bar Island, which is located just north of the town. Bar Island Trail (starts at the end of Bridge Street) is only passable at low tide when the gravel and shell path appears and leads to the small island. There is a little walking trail that leads to the top of the island and has great views of Bar Harbor during good weather. You can begin walking across about two hours before low tide, and just make sure to return before the next high tide or you’ll be stuck on the island! A lovely walk to Bar Island, even in misty weather. Southwest Harbor, on the other side of the island, offers a quieter scene for those looking to relax without the crowds. Red Sky is probably the best restaurant in town, with incredible meals and an ample wine selection. There are also many companies offering kayaking, whale watches, lobstering trips, sailing, glider tours, and much more. Although we were thoroughly blissed out during our trip to Ogunquit earlier in the month, we completely fell in love with this more rugged part of Maine. If we could have stayed for another month, we would have. The state slogan doesn’t lie, summer in Maine really is the way life should be. Every summer for nearly as long as I can remember my mother would load up the van with our luggage, beach chairs, boogie boards, coolers and sand toys. My brothers and I and would pile in and we’d wind out of Vermont, through New Hampshire and into lower Maine to whatever house trade had been arranged that summer. 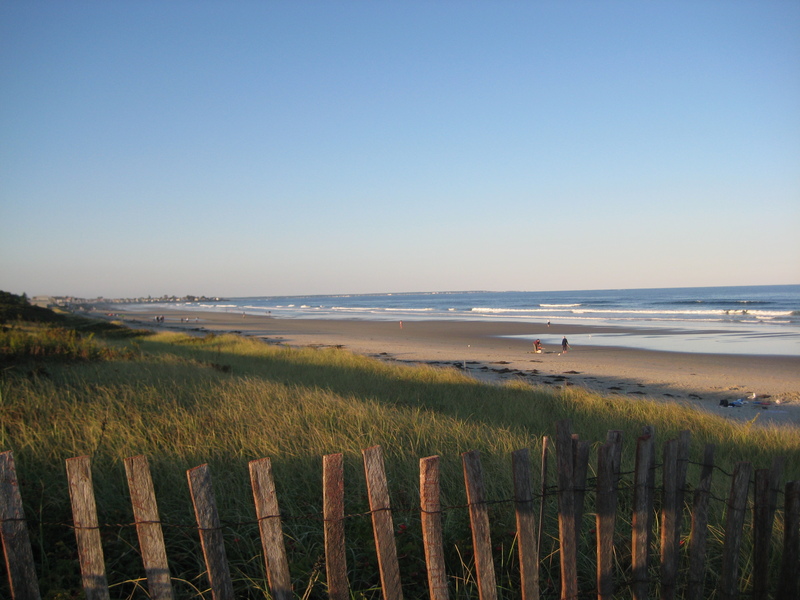 We stayed in a variety of little towns over the years, but the times we spent in Ogunquit hold the strongest memories for me. We spent most of our time at the Footbridge Beach, aptly named for the footbridge you have to take to cross the saltwater inlet that separates the beach from the town. My brothers spent hours fishing for crabs off that bridge, tying hot dogs to empty plastic strawberry containers and lowering them into the water. Pulling the homemade traps up at just the right speed to keep the crabs attached. Bragging to the other kids that they were able to catch more, and if not more, theirs certainly were bigger. I spent hours walking up and down the 3-mile stretch of sand with my cutoff jeans and sunburned nose, listening to the latest Guns N’ Roses single on my walkman over and over and over and over. One summer, a friend of mine came out to Ogunquit with us and we met a boy from Quebec who told us all about escargot. We pretended to be fascinated and impressed, and then secretly made gagging faces behind his back. The water in the Atlantic seemed like ice water to me, but we went swimming anyway because there are no beaches in Colorado. There was always an abundance of seaweed in the ocean and we would drag it out by the fist-full and make it into wigs to decorate my youngest brother’s head when we turned him into a sand-sculpture mermaid. Lunch was lobster rolls, and fried clams, and grilled cheese at the seafood shack up the street. Dinner was twin lobsters with baked potatoes and corn, followed by blueberry ice cream from the place right in the center of town. When I smell sunscreen, I see that beach. For me, it represents an idyllic point of childhood, some of the best summer memories I have. When Justin and I arrived in Ogunquit last Friday night, the first time I’ve been in more than 15 years, the first thing we did was walk down to the Footbridge Beach to watch the sunset. We passed a group of boys catching crabs off the bridge. They were using hot dogs.